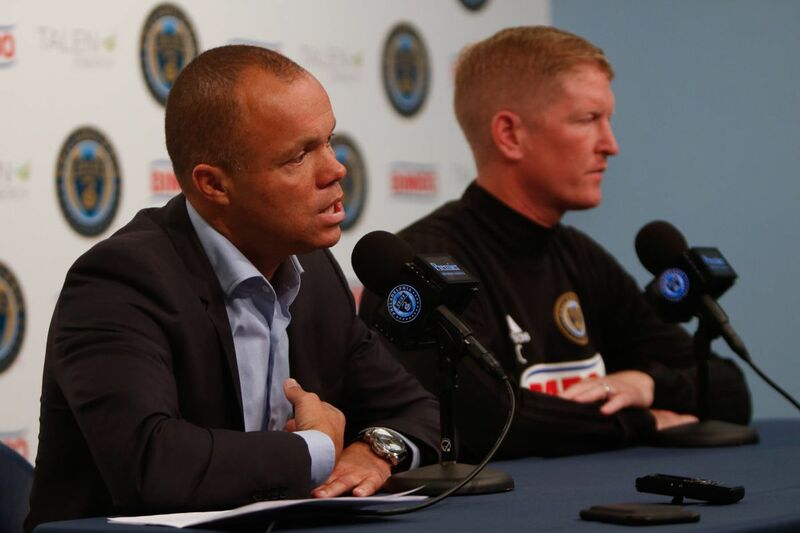 Philadelphia Union sporting director Earnie Stewart (left) confirmed that manager Jim Curtin (right) will remain with the team in 2018. Union sporting director Earnie Stewart isn't the social media type, but he still knows well that many fans want manager Jim Curtin replaced. Stewart delivered a forceful response to those critics on Wednesday, giving Curtin perhaps his strong backing yet as the team heads into the offseason. "I'm very pleased and proud to announce that Jim Curtin will be the head coach in 2018," Stewart said right near the start of his end-of-season press conference with Curtin. "We'll make sure that we keep going in the same direction that we have been going on. I think he's a big part of this foundation that we've laid down." Stewart ran off a list of Curtin's statistical accomplishments, from making the 2014 and 2015 U.S. Open Cup final to being the first Union head coach to record double-digit wins in consecutive season. But the real praise came from what Stewart has seen with his own eyes. "What is the progress of a player? I also look at my head coach the same way, and I think he has progressed in a great manner," Stewart said. "Once again, I'm very pleased that he's going to be part of this 2018 season, and that we can build on the continuity that we have." Stewart specifically cited the Union's turnaround after a eight-game winless streak to start the season nearly sunk the season right out of the gate. Maybe it did anyway, since the team didn't make the playoffs. But even back then, Stewart saw something that he liked. "I see how the technical staff and the team responded," Stewart said. "Everybody counted us dead and out at that moment. It was asked for change [by fans]. In my view, it was the worst thing that could happen at that moment." He later added: "In a time when everybody thought we were down and out, at one point we were in a position once again to get back in the playoffs, and that is a great credit to Jim and his coaching staff. I'm very pleased with that [and] very pleased that he will be back." Curtin was happy to accept the praise, of course, especially while sitting next to Stewart on the podium. The Oreland native called the eight-game winless streak "the hardest moment of my young coaching career" as he spoke about Stewart's support then and now. "I'll be loyal to him forever, because of the fact that he showed a belief in me in a tough time," Curtin said. "I do believe that's when you learn the most about people, and Earnie is a real leader in that regard." Now Stewart has to be a leader in finding better players for Curtin to coach. Both men repeated the promises they've made many times this year about bringing in higher-quality attacking talent this winter. But Stewart acknowledged that there will be financial restrictions on his ability to do so. That will be true even if MLS adds money to the pot of Targeted Allocation Money this winter, which is reportedly set to happen. "There's a set total of what we can work with," Stewart said. "That has nothing to do with any of the rumors going around in MLS of what's going to happen with TAM or all that. In the end, it's [about being] the best way to spend money. That's the way that Jay [Sugarman, the Union's principal owner] looks at it, that's the way that we look at it." Stewart said he has talked with Sugarman about needing to spend more money to keep up with the increasing number of MLS teams that spend big sums. Just within the Eastern Conference this year, Toronto, New York City FC, Chicago and Atlanta paid multi-million dollar salaries to multiple players. It's no coincidence that those four teams were the top four playoff seeds. The Union have just one millionaire, Alejandro Bedoya, and his salary this year was just under $1.2 million. "Of course we have those conversations, and I have to say that our ownership group, with Jay leading that, has been good," Stewart said. "But we've also chosen a path that we have as a club, that we started — at least since I've been here [for] two years, that's our pathway. That's who we are, that's who we want to be, and the most important part is we've got to come to grips with that." He added that the team is "looking forward to doing more than we have in the past, and that's very exciting." It helps that the Union cleared nearly $3 million in salary off the books with Wednesday's dramatic sweep of roster moves. But Stewart tempered his optimism with some even more blunt language. "Can we spend like Toronto? No, we can't. It's as simple as that," he said. "So we have to do it in a different way, and I think we've found that way. … Not going overboard, because we are who we are, and we'll go forward from here with the same attitude and the same ideology we've had in the past." In addition to spending on players this winter, Stewart also may have to go find some new additions for the coaching staff, as goalkeeper coach Oka Nikolov is leaving. Top assistant Mike Sorber reportedly may leave too, for MLS expansion team Los Angeles FC. Stewart didn't confirm the report, but he didn't entirely deny it either. "I'm not aware of that," Stewart said. "Mike hasn't come to us to say that he's going, so up until today, I can say the rest [beyond Nikolov] will stay. But yeah, soccer is soccer."